Expectancy adds minimal value to our travels. Setting out, on a journey for a day, or two, or days on end, expecting the expected is nothing beyond our norm, our due course; comfort, as some may call it. Comfort is the public enemy of a truly memorable trip. Expecting the expected, and cajoling one’s body and mind through the expected events and circumstances when the expected appears and executes itself; comfortable as it may be, it’s leagues away from memorability. We remember glimpses of our travels through the unexpected. The virtually unknown crab shack (hideously delicious) discovered amidst pure desperation, an unannounced downpour that led to a scurry into a previously hidden vintage shop, road construction and its consequential detour, birthing explosive panoramas of cypresses, pines and willows. Resting on the southern shores of the peninsula, Busan’s warmth and radiant beaches rarely hint of snow showers. Even in the winter months, when Seoul and its surrounding regions shiver and solidify like chocolate mousse in a blast freezer (minus seventeen degrees Celsius recently), Busan generally sports a gentle southern breeze, its temperatures never threatening or malicious. After a two-day gastronomic galore, dark clouds swarmed in like horizontal pillars of smoke, and the skies opened up, regurgitating white powder and clustered matter with all its might. My cognizance had never pictured Busan cloaked in white. There is something intensely bothersome about non-accumulating snow; it’s a tease, a master of the push-and-pull, showing you glimpses of purity, yet taking it back before the density of its colors are fully revealed. Exceptions exist, and when an unsuspecting mind meets a wall of white flurries, dusting the windshield, brushing hotel window panes, caressing every barren branch, accumulation is an unneeded luxury to compose the luscious silhouette created by the clouds. Fish mongers swiftly scurried about, not with panic or urgency, but with inexplicable joy, almost childlike, at this phenomenal downpour of snow. Beaming. Tourists, huddled under canopies or behind glass walls of some multinational coffee shop chain, absorbed the site of purity falling silently, at times at a slant, at times sideways, but always silently. Beaming. A gray-haired gentleman briskly walks with a young boy of no more than five years old, appearing to be grandfather and grandson. The older man’s knit scarf comes off, and he wraps it around the neck of the younger man. Both beam excitedly. The unexpected snow cleansed our retinas, drawing us closer to the edge of our known comforts, and ultimately unwrapped its purity. Standing, walking, sitting, beamed we did. Giddily. With monstrous snowflakes hitting the sides of our faces, we loaded our luggage one by one, not knowing what the storm would bring to Kyungju, our destination. As we made our way, I was reminded of a Busan I encountered years ago, a city and shoreline on the brink of a mild hurricane. The soot-like clouds seemed abnormally low that day, as if one could grab a chunk if one stretched out far enough. The winds were gathering speed, gusting in some instances. At first, the raindrops were scattered, not menacing at all. But then after a roar or two of a thunder’s cry, I “heard” the rain as much as I saw it; Haewoondae beach and its shallow waters magnified the chorus of raindrops falling on its surface. Odd as it seemed, a hurricane-infested beach was incomprehensibly more attractive than a sun-infested one in mid-July. Mother Nature’s flakiness, it turns out, memorialized an otherwise uneventful trip. “With our backs to the snowy mayhem” would be entirely inaccurate. For one, the entire drive from Busan to Kyungju was never snow-free, and secondly, “mayhem” is a relative term. True for the driver, but not so for spectators. “Through white curtains and grayish black slush,” we drove the expected two hours to the ancient Shilla capitol. Kyungju is just the place. As the capital of the thousand-year Shilla dynasty, it bears the many fruits of the era’s cultural heritage; tombs, artifacts and landscapes. Not unlike Washington, DC’s National Mall and its countless museums, where flocks of students and chaperons partake in the annual summer pilgrimage, Kyungju is the most popular field trip destination for many budding academics. But as de Botton accurately observed, not many look at its fruits properly, and consequently, Shilla’s legacy rarely scratches the innermost corners of our thoughts, and too often leaves travelers indifferent. A thousand-year history bears a heritage too rich for words. On a clear day, when the yellow and orange sun beams directly above one’s head, eyes dart from left to right, trying to encapsulate the green, the brown, the granite-gray. Too much for a pair of eyes to handle. An inherent beauty of snow lies in its ability to simplify matters, to cloak the distractions, the impurities, and leave standing only what is truly important. As I stepped out of our vehicle, and as my sneakers fell through a seven-inch white abyss only to be stopped by that friendly “squeek” of compressed snow, only two beings occupied by sight; five majestic tombs and the surrounding barren trees. The sky and snow-covered tombs were inseparable, the whites of both bleeding into one another, their boundaries blurred and unclear. Distinguishing, with any degree of certainty, the end of earth, mound, tomb, and the beginning of sky, atmosphere, air was a daunting task. The color “white,” however, was distinguishable in shades; pale, bright, stern, mellow. This panoramic plataeu of white was disturbed only by specks of black representing far and near trees, standing as guardians of the dead, and even this disturbance was no menace at all, instead adding depth, perception and balance to the otherwise overwhelming display of the shades of white. Ruskin was lamenting the speedy haste of tourists, boasting the ability to blast through Europe in a week by train; going instead of being. Kyungju and its royal tombs would be nothing more than a few white blurs from the vantage point of a warm car. Feet sinking in inches of powder, the steam from our breath billowing in clouds of white, tasting the moist winter air – every step draws one closer to Shilla, to the story of its kings, their reign, and their long-forgotten legacies. Closer to beauty in its absolute terms. A family of five was busily snapping photos; father shifting left and right for the perfect angle, mother struggling mightily to harness her three boys; and the boys preoccupied with the size of their snowballs. One would hardly guess that this, indeed, is a grave site, laden with death and sorrow. Yet ironically, death, symbolized by the five hill-like tombs, resembled nothing less than pure beauty, the effects of funeral somber nowhere to be seen. Perhaps the white sheet of snow has cast a spell, suppressing whatever gloomy thought squirming to emerge from the underworld, just layers beneath our feet. But on a second thought, even in the spring and summer months, the tombs, with their lush greens resembling pastures more than burial grounds, may be deemed beautiful; even then, the tourists come and go, families pose and smile, children run about. The snow must then have another meaning. A pilgrim’s confusion is exemplified by layers of snow. How easy it would have been to walk besides those mounds of dirt with no thought, no inquisition; as Kazantzakis explained superbly, “without any great convulsion.” Travel with no convulsion is like locking one’s bedroom door and embarking on an epic journey from one’s couch to one’s bed, then on to the mysterious windows (This was actually done by Xavier de Maistre, written about in his Journey around My Bedroom). Beneath the snow, beneath the layers, exists fruits of history that have been muted indefinitely. For a traveler obsessed with the “speed” of travel, a journey through Kyungju, through Korea, is simple, uncomplicated; but for those who question the “innocent tremor of beauty” – the cities’ flashing night lights, the thumping music, the car-riddled roads and cloud-piercing skyscrapers – one may hear the groans of centuries of invasions, bloodshed and hunger. A hiatus of invasion or foreign occupation was a rarity for Korean Peninsula; the various Chinese tribes from the north, the Japanese on their ships from the east. Even when Shilla conquered its rivals and built a thousand-year dynasty, blood was poured on the streets of Kyungju and elsewhere to maintain that power. After the Second World War, the peninsula was split in two, and a civil war tore through, permanently scarring the mentality of those surviving and even their unborn descendants. Financial hardship drove people to the mountains in search of food – tree barks, grass, dirt. The economy boomed like no other example in modern history, but at the cost of democracy and individual freedom; even the president at the helm of that exponential growth was gunned down. Bloodshed, pain and tears defined this peninsula, more than any of us would like to readily admit. Much of this has been drowned in “beauty,” perhaps of a misunderstood variety. 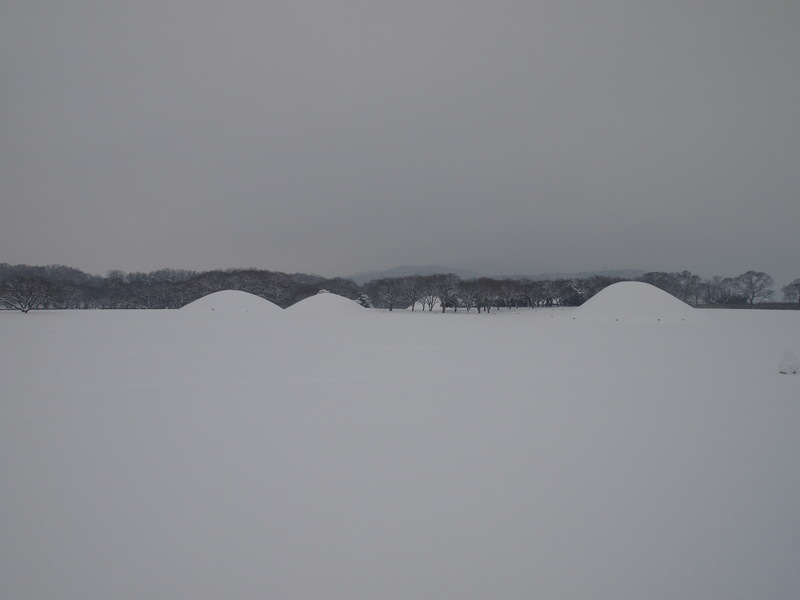 Perhaps the “snow” layering the ancient tombs of Kyungju have deeper meaning; perhaps it is a symbol of a new beginning, a cleansing of whatever impurity that lies beneath it, within the deathly mounds; an opportunity to press the refresh button. Free from the costly race that has deceived us with economic fortune, free from the corruption that has become the new norm, free from the pain-drenched conscience of every pilgrim walking the grounds. Perhaps snow is, truly, beauty, and beauty is truly possible. Cloaked in shades of white. My gastronomic senses instinctively recognize “beauty” when they see it; the nose first detects it, the ears bring in the crowd, the sizzle, the eyes memorialize on first sight, the tongue and mouth take care of the rest. Our footrace through time amidst the snow-covered tombs was only complete with another pilgrimage to a traditional bakery infamous for its “Hwangnam bread”; a delicate dough filled with sweet bean paste, imprinted with its signature logo and baked until the very tips turn ever so crispy. Proportion and texture stands out. Each pastry is hand-molded from scratch, and the dough has surprising density, despite its incredible thinness; Chewy Chips Ahoy after they are heated for ten seconds in a microwave, but better. The sweet bean paste tastes nothing like the sugary black matter easily found in cans. Also handmade from scratch, the smooth yet lightly grainy texture perfectly matches its buttery richness (but, of course, no butter added). Beauty, so easily found, so easily consumed. But then again, the slushy roads were no easy task to reach this harbinger of beauty, and it is doubtless that its beauty was magnified by each step we took amongst the dead kings and ever-falling snow, still visible just outside the steamy glass windows. Beauty led to beauty, all falling into its respected place, enhancing and never overwhelming. Exotic lands and voyages across forests and rivers may reveal some layers of beauty, some value not easily discoverable in everyday life, say in one’s bedroom. But beauty’s true shades, its true colors, are closer than we often assume, at times right above us in the falling snow, right in front of us in the tombs of dead kings of bygone eras, and right beneath our feet is squeaky snow. 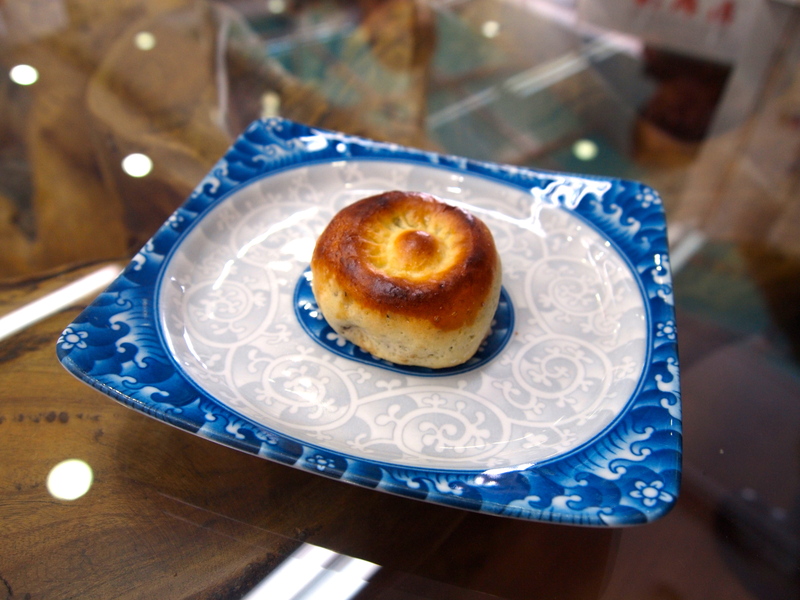 Perhaps the first bite into a steaming Hwangnam bread is all you need to fall into an aesthetic abyss. Some say you eat with your eyes. I say you eat with your circumstances; why limit eating to the eyes? How you got to the vendor, on what road, in what weather, who took your order, in what plate was your pastry given to you, who partook with you, did you stand or sit, coffee or tea, was there a line – all this accompanies one’s “eating.” Not at all complex, just circumstantial. The surroundings make the food, such a truth in all the gastronomic corners of Korea. Handing one’s passport and boarding ticket to the attendant at the international departure terminal is an oft-overlooked trigger; memories of all hues and depths percolate in one’s conscious, filtered and recollected. The attendant glances at my passport photo, looks up at me, glances at the photo again, as if the photo is nothing more than an alter ego bearing no resemblance to the man thirty inches away. One last look over my shoulders, crack one last smile; one last wave goodbye, before reentering the vortex called reality. The annoyance of removing one’s shoes and the ritual of posing within the all-seeing body scan machine shuffles one’s thoughts, not in any particular order, yet cinematographic. A mind does not remember every morsel of detail from a trip, however short or prolonged. Like an artist, it harvests only what it chooses to harvest, carefully picking the highlights of the trip’s crops; and scenes are filtered, some crisp and some fuzzy, to embed permanent sketches into the soiled walls of our conscious. Vincent van Gogh would latch unto this phenomenon in an instant, in which some colors, contours and characteristics are chosen amongst others, brought out into the fore. Yet the exaggeration still represents “reality,” and resemblance takes on a completely different subjective meaning. Snow-covered tombs of ancient Shilla kings thumped the outer edges of my thoughts as I closed my eyes in my cramped economy seat. Beauty is majesty cloaked in white, the hurt of bygone eras caressed and blanketed by all-forgiving, forgiving and healing layers. Beauty is simplicity in design and taste, balanced under the scrutiny of all one’s senses and with its surroundings. Travel is beauty, but only if one’s soles are willing to embrace the sound of sinking snow. I love ‘you eat with your circumstances’. Great post. Glad you liked the piece. Thank you for visiting!